Through a shimmering mass of silver baitfish, a dark shadow slowly emerges. A huge, turned down mouth and burly, speckled brown body glides slowly forward. A thick, rounded tail fin sways back and forth in long, languid strokes. A gentle giant is approaching. This is a Goliath Grouper, and its story, once melancholy, is finally emerging from the dark. Accounts from anglers and observes give a glimpse into a past where Goliath Grouper populations abounded. These fish would gather in the hundreds, perhaps even thousands, creating dark masses moving on the ocean floor. People have been hunting Goliath Grouper for meat and sport since the late 1800’s. As one of the largest fish found in near-shore waters, they became a favorite prey to both line and spear fishermen. As Florida populations grew, so too did the demand for seafood to fill diners’ plates. By the 1970s and 1980’s, Goliath Grouper populations were facing extinction. However, help was on the way. By 1990, the devastating effects of fishing on this species compelled lawmakers to declare Goliath Groupers a protected animal. Strict regulations prevented the harvest of Goliaths from both state and federal waters. Law enforcement agencies, like the Florida Fish and Wildlife Conservation Commission, educated anglers on proper handling and release techniques. Now, almost 30 years later, we are finally beginning to see what we hope is the return of this revered species. Goliath Groupers were once viewed in masses from the surface. Today, SCUBA divers and researchers gather every summer to watch this fascinating species group again on our local reefs. As early as July, Goliath Groupers begin arriving. Some of these generally languid creatures will travel up to 300 miles from their home. 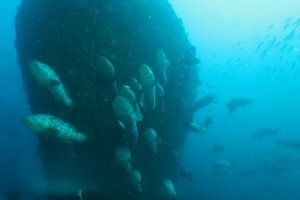 They cluster on artificial reefs ranging from the Jupiter Wreck Trek, to Corridor and the Danny off Palm Beach, down to the Castor in Delray Beach. This year, the Ana Cecilia, West Palm Beach’s newest wreck, became a favored spot to Goliath aggregations and photographers alike. As populations increase so too does research regarding this alluring fish. 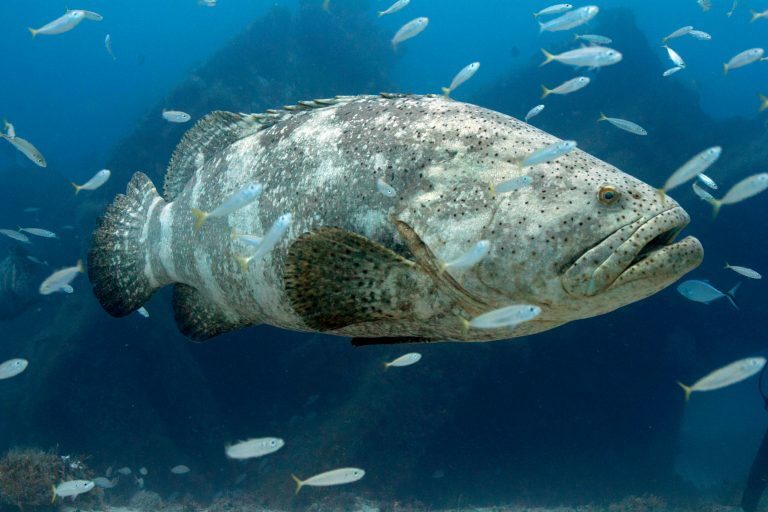 Scientists are now more able than ever to tag and track Goliath Groupers. Although they spawn every year, the species’ lengthy growth and sexual maturation greatly inhibits population increase. Male Goliaths reach sexual maturity sooner, when their bodies are shorter in length. It generally takes a male 5 years to mature, growing to around 36 inches. Females are hampered by an even longer timeline. They do not reach maturity until year 6 or 7, between lengths of 47 to 53 inches. Goliaths are also a lethargic, territorial fish. Spawning aggregations provide one of few reasons they will travel away from home. The slow-moving fish are relatively slow growing as well. The oldest recorded Goliath Grouper was 37 years old. Scientists, however, estimate that they may reach ages of 50, or even older. Just as Goliath rely on man-made fishing restrictions, they also rely on populated waterfront areas inhabited by people. Juvenile Goliath Grouper spend the first few years of their lives in estuaries. They live among mangrove roots on our shores, in areas subject to pollution and harmful, nutrient-rich runoff. 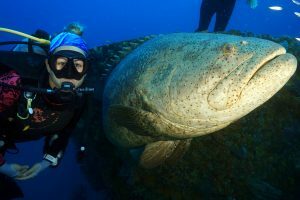 Humans play a huge role in the wellbeing of the Goliath Grouper species. The more we can spread knowledge of this important fish, the brighter their futures will shine. 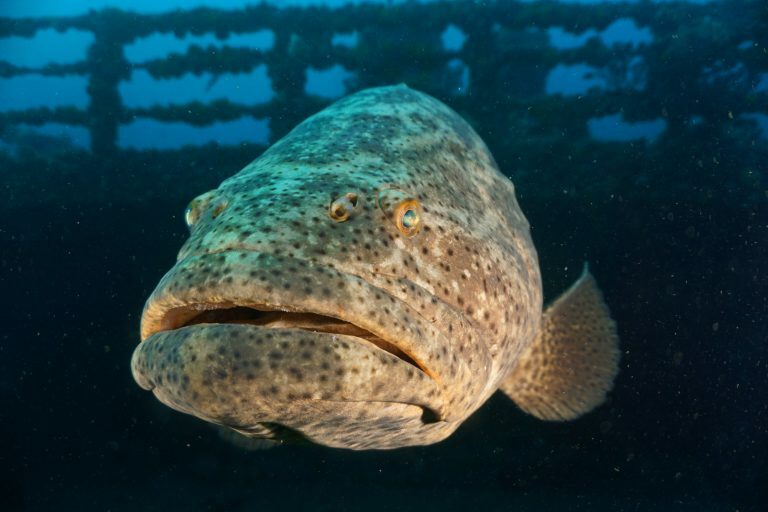 Aside from humans, Goliath Grouper face few predators. As smaller juveniles, they are at risk of predation by aggressive fish like barracuda and king mackerel, as well as eels. Once they mature, sharks are one of the few adversaries facing Goliaths. Through responsible fisheries management, scientific research and continued conservation efforts, we can help ensure that the Goliath Grouper population continues to expand. Showcasing the benefits of these creatures as a catalyst for tourism provides justifiable economic incentives to retain Goliath harvest restrictions. South Florida is one of few places around the world where Goliath Grouper spawning aggregations reach such a staggering size. 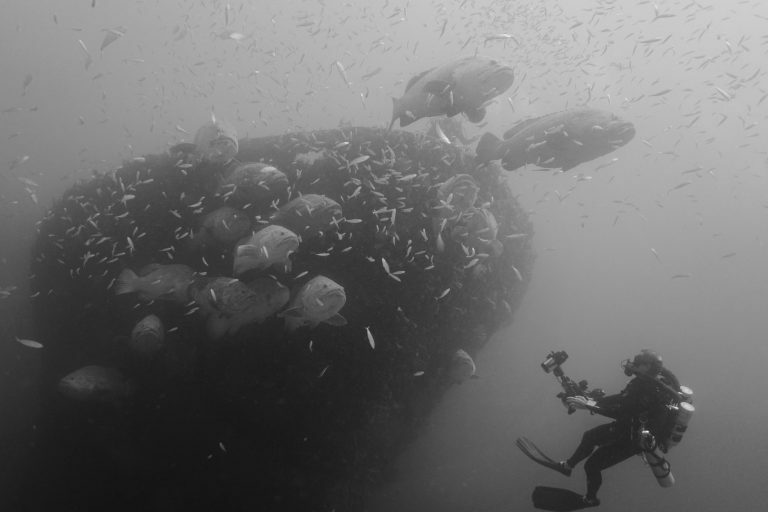 Diving with these colossus creatures is an experience that few are lucky to behold. While aggregations disband in fall, there are residential Goliath Grouper on many of our local reefs and wrecks. You can call us to arrange boat charters to these locations and experience these amazing animals up close. Beginning photographers have a season to advance their skills. A photography course over the fall will help ensure that you are ready to capture one-of-a-kind shots during next year’s aggregation. Trying different photography equipment at events like our upcoming Sea&Sea demo will also help you choose the right gear. To enhance Goliath Grouper research efforts, you can report sightings on the FWC’s website. Follow Force-E on Facebook to learn more about the unique wildlife that makes South Florida an internationally renowned diving destination. We can’t wait to see you under water!